In order for your Hosted Exchange service to function correctly and to take advantage of all the features offered by Exchange, you must have specific DNS records on your domain. The various DNS records you will require and how to add these records to your domain is explained in the below step-by-step guide. Mail Exchanger (MX) records are used to route emails sent to your domain to the Cobweb Hosted Exchange platform, effectively acting as an address for all emails. In order to avoid disruption to your current mail service, you should not change your MX records until you are ready to start using your mailboxes with Cobweb. All email accounts on the Hosted Exchange platform are protected by MessageLabs, a comprehensive antivirus and anti-spam protection suite. As part of Cobweb and MessageLabs' continued efforts to ensure maximum data integrity and protection, all domains hosted by third parties (and utilised on Cobweb email accounts) must have an SPF record configured. An SPF (Sender Policy Framework) record is a measure of protection against email spoofing. It specifies which servers have the facility to send from your email accounts, negating the possibility of someone using your address to send out unsolicited email. If you have any questions regarding the above or any aspect of your service, please consult the Knowledgebase or contact us on support@cobweb.com. In the search box enter your domain name and click the search icon. 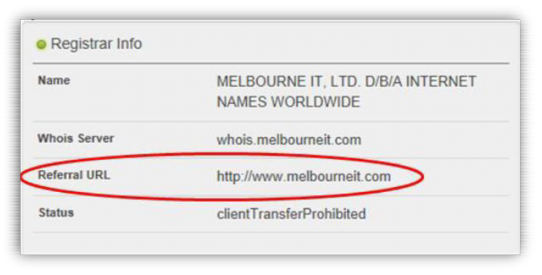 Your domain host will be shown in the name field under the Registrar info section. To contact your DNS provider go to the Referral URL where you will find their contact information. Provide your Domain Provider with the Cobweb Hosted Exchange DNS records.